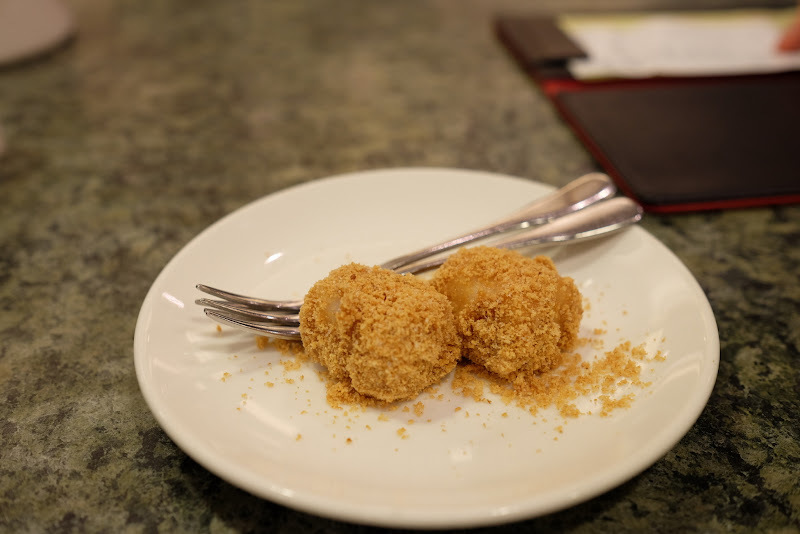 Shin Yeh is one of the top restaurant recommendations you'll get when you research traditional Taiwanese cuisine. We had our hotel concierge book us a reservation at their original branch location. We were seated in their basement level, which had fairly tightly packed tables. I would have preferred to sit somewhere with windows, but I don't know if that is an option. I'll say up-front, that Chinese food like this is not ideal for parties of 2. You can really only order 2-3 dishes per person. We ordered 3 and didn't finish everything. 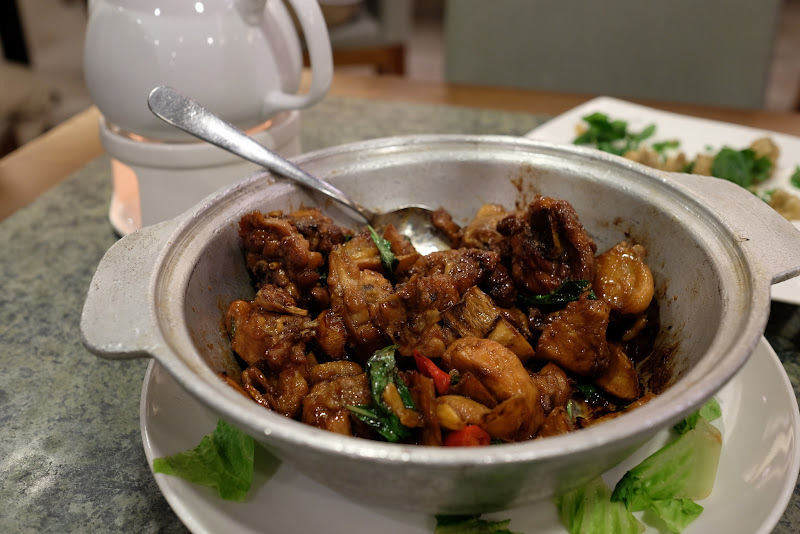 We ordered a fried oyster and basil dish, a single large spring roll, a chicken stir fry dish, and steamed fish. There were significant language barriers when it came to ordering the fish for some reason. 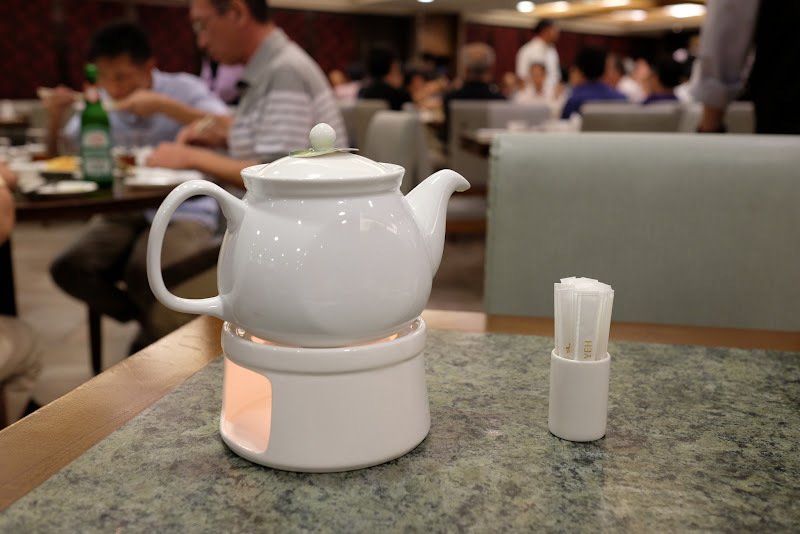 Not that I expect every server in Taiwan to be fluent in English, but we appreciated that at every other store and restaurant we went to, once I had explained my Chinese was not great, they would send us their server most fluent in English to try and facilitate communication. Not at Shin Yeh, though. We had an older auntie waitress, and she became easily exasperated when I didn't understand what she was trying to communicate to us about the steamed fish. I think it had something to do with the size of the fish. I said simply that we wanted a smaller fish, since it was just the two of us, and she kept trying to get me to OK some unit of measurement I didn't understand. You'll see at the end of this post our receipt. We received 15 mystery units of the fish, and it cost about $60 USD (!!! if you know what the mystery units are, please please enlighten me!). She also sent us the "large" size of the chicken dish, despite my ordering "small". And we were charged for tea (not much money, but still, wtf?). At a nearby table of businessmen, one obviously got something lodged in his throat, and we spent the rest of our dinner listening to him alternatingly talking as if nothing was wrong, and hacking away extremely loudly. I seriously thought he was choking and might drop dead. I was surprised that he didn't (a) excuse himself to go to the bathroom, and (b) no employees went over to ask if he was OK. Strange, right?? 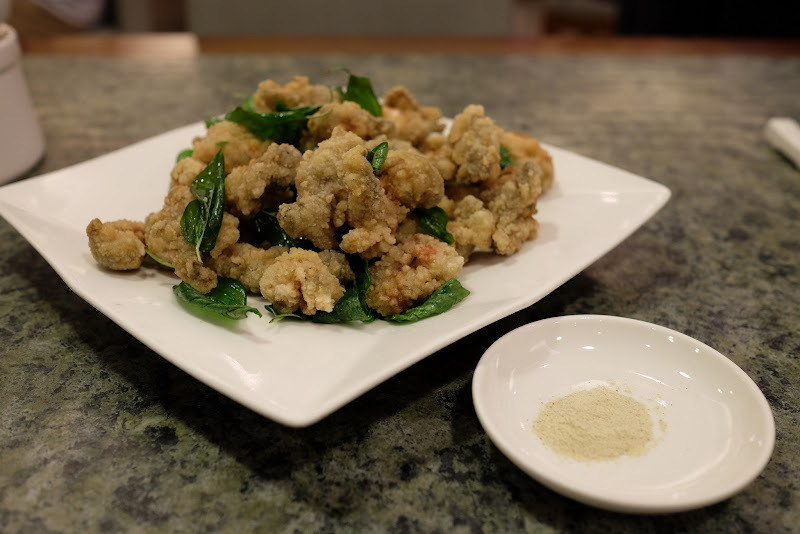 The fried oysters looked much better in the picture than they tasted. They weren't nearly hot enough when served. A massive spring roll thing... this was pretty tasty, I'll admit! I felt it was a little on the dry side, though. The Three Cup chicken tastes exactly how you would expect. Cory was not happy that it was not deboned. The drama-ridden steamed fish. Honestly, nothing special, and at the market price they charged, totally overpriced in my opinion. Steamed fish at Shin Yeh. Pretty expensive actually. Free peanut covered mocha for dessert. Would much prefer fresh fruit (given Taiwan's reputation for it! ), but I'll take what I can get. Our receipt, so you can see what we ordered. Can you believe this cost more than double what we spent at Tresors de la Mer? What a disappointment. Bottom Line: If you're only 2 people, skip. 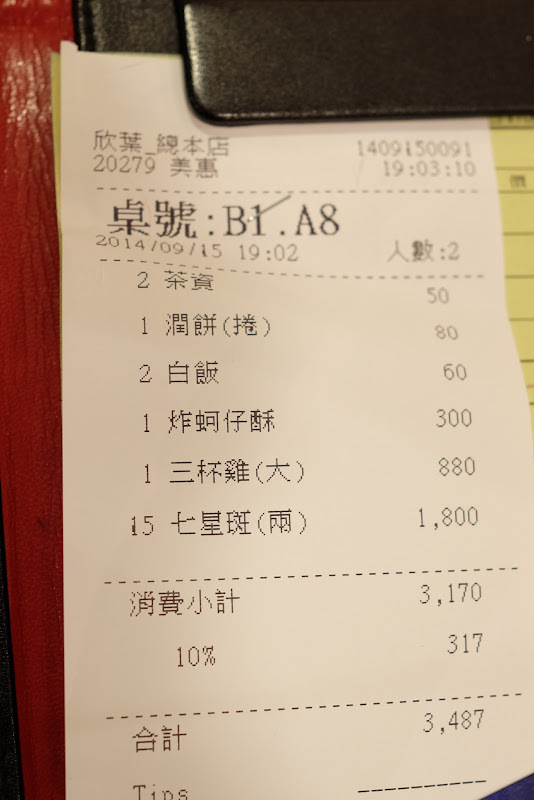 Pricey for what we got, and not as friendly service as we had experienced everywhere else in Taiwan. 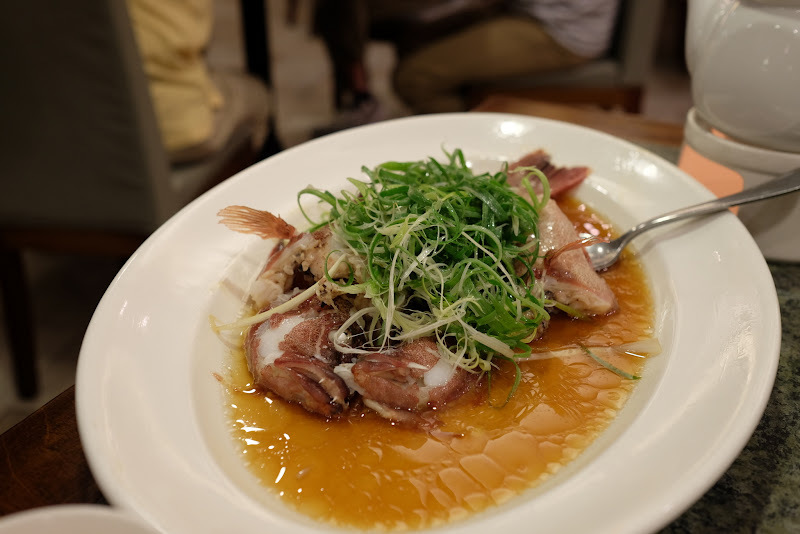 This was an extremely disappointing experience for me, and I think our small selection of dishes was a poor representation of Taiwanese cuisine. I would only consider returning here if I was with a group of 5+ so we could sample a much wide variety. hi! Wandered over to your blog from your link on Pin Chuan Lan! Thanks for all the shout outs. I totally agree that Shin Yeh is best for bigger groups to share the food. I believe they charged you by weight for a fresh fish, but it's too bad there was something lost in translation as there is a really good steamed sea bass with small olives that is served boneless and not too large. If you ever return, my favorites there are the run bing (spring roll that you ordered), gua bao (pork belly bun), sesame oil kidney or liver and pineapple shrimp.. sometimes the sweet potato porridge.